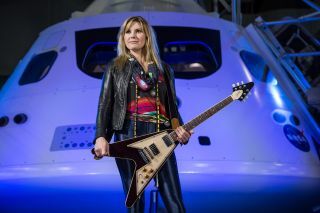 Musician Grace Potter debuts new music video celebrating past and present women of NASA. Grace Potter struck a chord with music lovers and space enthusiasts alike when she performed with the National Symphony Orchestra (NSO) Pops at The Kennedy Center in Washington, D.C., to celebrate NASA's 60th anniversary earlier this month. Potter, a Grammy-nominated recording artist, is an unparalleled presence on stage. NASA asked her to perform as part of "NSO Pops: Space, the Next Frontier," a musical series in which the NSO, alongside guests like Potter and Coheed and Cambria, performed space- and science-fiction-inspired pieces to celebrate NASA's big anniversary. In 2016, NASA invited Potter to Johnson Space Center in Houston to collaborate on a music video for "Look What We've Become." The song and video highlight women at NASA and their contributions to engineering, science, aerospace and spaceflight. Potter performed this song at the anniversary event because it honors women in space and science. In the video of the performance, it's clear that Potter is as comfortable performing with an orchestra as she is on stage with a rock band. Her striking voice carries with effortless power. "And they always told us we would be nothing; look what we've done … And they always told us we would be nothing, but look what we've become," Potter belted over the orchestra. Her lyrics are shaped by the hard work of women at NASA from the past, present and future, and it's clear that the song was written to inspire and empower the next generation of women interested in STEM (science, technology, engineering and math) fields. In a video interview with Space.com, singer-songwriter Grace Potter discusses her thoughts on the current state of space science, its effect on human consciousness and how it's intertwined with music. Potter has supported space and space-scienceefforts for years. Besides running the "Space_Potter" Instagram account, on which she posts space and science imagery, she has been known to talk about space news on stage. In 2015, Potter even spoke with Space.com about how space influences her and her music. To follow Potter and her musical, cosmic adventures, visit gracepotter.com.